At Indiana University, faculty input is a key part of the classroom design process. Here's how a recent symposium fostered cross-campus collaboration and future-thinking conversation about new learning spaces. 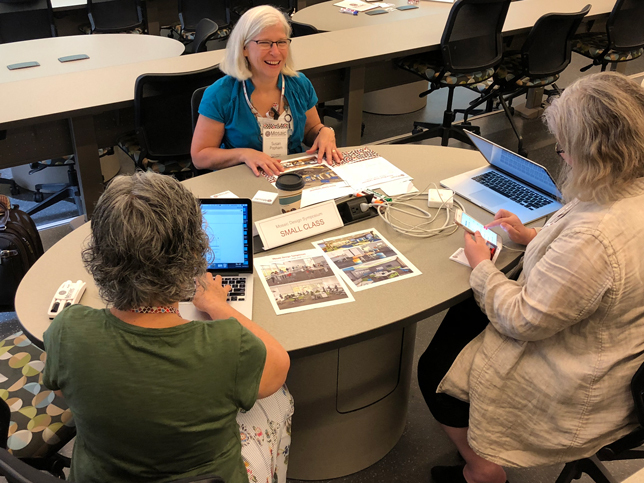 Indiana University's Mosaic Initiative, a program that supports innovative learning space design, research, and comprehensive support across the institution, regularly brings faculty voices to the design process when creating our active learning classrooms. To give those conversations a formal home, Mosaic recently held the inaugural Mosaic Design Symposium, a day of workshops and brainstorming about the future of IU's learning spaces. The event, produced in partnership with the university's Learning Spaces team, convened 21 Mosaic fellows from across IU's seven campuses to design classrooms of the future. The Mosaic fellows, who spend an academic year teaching in and exploring other active learning classrooms, were an ideal group to engage in a future-thinking conversation about space. The symposium was structured to maximize creative thinking, collaboration and sharing. Prior to the event, each fellow was asked to choose a traditional learning space to reimagine: a large lecture hall, a medium-sized classroom, a small classroom or a computer lab (most fellows chose the type of classroom in which they most often teach). The participants' self-sorting created multi-disciplinary "design teams" that included fellows from different IU campuses. Providing this opportunity for cross-discipline as well as cross-campus collaboration was a major goal of the symposium. On the day of the symposium, each design group received inspiration images of the classroom of their assigned type. Then, each group was asked to create their own classroom with a design prompt that encouraged participants to "think differently and think big" about their classroom design. Over the course of 90 minutes, the groups were asked to brainstorm and then both sketch their ideas on glass boards and capture their ideas in a shared Google doc. In that way, their work could be shared with multiple stakeholders. After lunch, the groups each presented their own designs and engaged in conversation about their ideas. Members of the Learning Spaces team were on hand to listen to the faculty discussions about the future of spaces at IU. As Larry Darling, principal learning spaces engineer, noted, "This event presented a unique opportunity to observe the design process, as end users planned their ideal teaching environments. This type of access challenged my paradigm of what defines a successful learning space. As I move forward, I will be able to share this refinement with other members on my team as we implement future classrooms." Spaces that encourage interaction. Most of the designs focused on encouraging interactions within student groups, among student groups, with instructors, and with student-generated work on whiteboards and monitors. Access to students. Faculty in all of the space design groups wanted easy access to students. They desired the ability to move around the room as well as the ability to view all students wherever they were in the classrooms. Easy-to-use technology. Faculty designed rooms with technology that was consistent, user-friendly, flexible, mobile (if they wanted to move something out of the way for a class meeting), and that fostered student content sharing and collaboration. In the eyes of IU's Learning Spaces team, the Mosaic fellows' space designs were unique and pushed the boundaries of what is currently being designed at the university. For example, one particularly compelling design was the "tiny house" classroom. Inspired by Georgetown University's Red House project, the tiny house is a free-standing building (a cottage, as a matter of fact) containing formal learning spaces as well as several informal learning spaces. Without leaving the tiny house, students can flow from group study to formal instruction to consultation with a professor to post-class decompressing, all in one space. The faculty also proposed a natural aesthetic by designing ample windows to allow for sunlight and views of the outside. "We pushed ourselves to design without considering cost or feasibility," Associate Professor of English and Senior Mosaic Fellow Andy Buchenot explained, "but by the end [of the symposium] we found that the principles animating our infeasible design could be applied to existing learning spaces as well." The classroom designs that the Mosaic fellows generated during the symposium served as valuable inspiration and feedback for the Learning Spaces team. 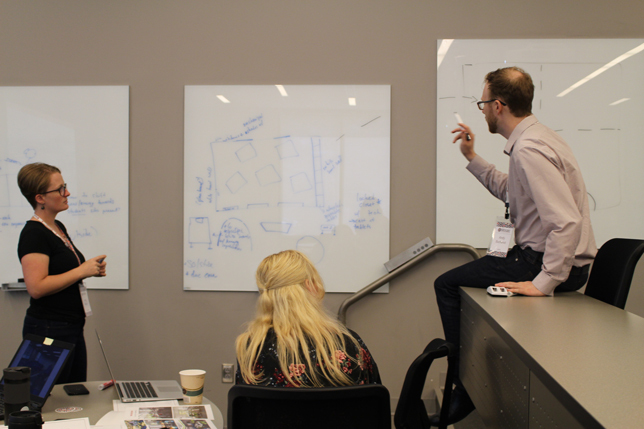 The fellows shared new ideas and approaches to design concepts and did so from a faculty perspective — bringing ideas to the fore that only those who teach in the space can produce. Just as importantly, the fellows' designs and thinking about space reaffirmed work that the Learning Spaces team is already engaged in. Many concepts from the fellows' designs have parallels in current IU projects, so our space designers saw the fellows' work as validation that they were on target with addressing current and future faculty needs. One takeaway from the symposium was recognizing the value of engaging faculty in conversations about space that can occur before we even conceive of spaces. Such broader, more conceptual conversations about space allow for greater creativity in considering what our learning spaces can and should be. For example, the tiny house design allowed the design team to think more about possible connections between formal and informal learning spaces. The conversations from the event and the Symposium Summary document have already served as a source of inspiration for current and new projects. Another takeaway was the need to involve different disciplines in the design of classroom spaces. As Mosaic fellow Adam Maksl, associate professor of journalism, put it: "Instructional space is often shared by many instructors that teach many different disciplines in many different styles, so it's natural to work together across fields to develop shared solutions to problems with those spaces." By bringing together instructors with different disciplines, we can design classrooms that support a wider variety of instructional needs. There are several ways we plan to build on the Mosaic Design Symposium's successful outcomes. In early October 2018, the Mosaic fellows who participated in this year's symposium will be invited to present their ideas to key stakeholders in classroom design, including space planners, architects, interior designers and learning space design engineers. 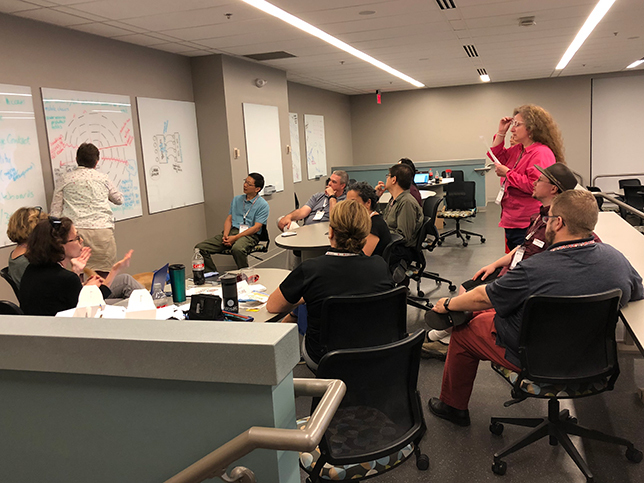 The Learning Spaces team continues to share the Symposium Summary document with different stakeholders for the purposes of incrementally including design ideas into a variety of new spaces. The Mosaic Initiative plans to hold a similar event with undergraduate students this academic year, bringing student ideas to both classroom space and informal learning spaces. And finally, the Mosaic Initiative will hold the Design Symposium event again next year, inviting all IU faculty to participate with the aim to broaden our conversation and come up with new future classroom designs to implement across the university.